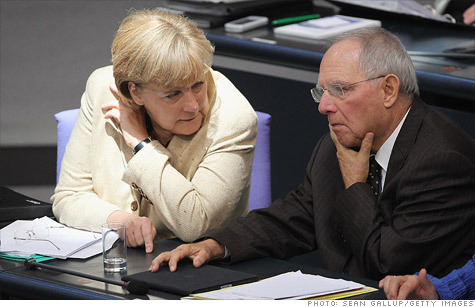 German Chancellor Angela Merkel and Finance Minister Wolfgang Schaeuble met at the Bundestag, where members of parliament voted in favor of expanding the euro zone bailout fund. BERLIN (CNNMoney) -- The German parliament voted Thursday to expand the bailout fund for eurozone member states, helping to ease fears of a potential Greek default for the time being. The vote passed the Bundestag by a large majority -- 523 in favor to 85 against, with three abstentions. The Germans were the latest member nation to approve an increase to the European Financial Stability Fund, which was established in the wake of the 2008 financial crisis. All 17 eurozone countries need to vote before the proposed changes can go into effect. So far, 11 have said yes. "Today's decision is an important contribution towards the resolution of the debt crisis and the stabilization of the euro," said Germany Foreign Minister Guido Westerwelle. "It is essential that countries with debt problems like Greece systematically pursue their savings and consolidation programs." The decision by Germany was watched closely because the Germans have grown increasingly wary of their role in supporting the weaker member states of the eurozone. The expansion of the safety net for eurozone countries, which is politically unpopular in many northern European nations, shores up credibility for Chancellor Angela Merkel. The proposal calls for the bailout fund to be increased to €440 billion after the initial €250 billion fund was tapped by Ireland and Portugal. Greece has been kept afloat by a multi-billion euro bailout from the European Union and the International Monetary Fund. In return, Greece has imposed harsh austerity measures on its population, which have sparked violent protests and also stymied economic growth. If Greece doesn't get another cash infusion, it will run out of money to pay its bills by mid-October. A decision on the next installment of Greece's €110 billion bailout is expected to come on Oct. 13, according to German Finance Minister Wolfgang Schauble. Meanwhile, monitors from the so called troika of IMF, EC and ECB returned to Athens Thursday after abruptly leaving the country earlier this month. But they came back to a frosty reception. Civil servants blocked the entrances to several government and administrative buildings on Thursday, including the Finance Minstry, the Ministry of Justice and Social Security. The actions were being taken "in front of the barbaric measures that have been decided on to further reduce wages, new tax increases, and mass layoffs, even in the public sector," said the union on its website. European leaders agreed in July to provide another €109 billion bailout for Greece. But some economists and investors see a structured default as the inevitable and necessary path for Greece to repair its fiscal woes. The original stability fund was meant to stem the crisis, but this has not happened. Instead, the crisis has intensified, feeding global instability and driving the eurozone to the edge of recession. The new powers will allow the fund also to buy sovereign bonds in the capital markets, a strategy designed to prop up debt prices and help struggling eurozone countries fund themselves. Many economists and investors believe that even the expanded fund is not big enough to be effective in the event that some of the larger eurozone economies, such as Spain and Italy, fail. -- CNN's Rick Noak contributed from Germany, along with CNNMoney staff writer Ben Rooney and CNN correspondent Diana Magnay.